At Golden Gate Physical Therapy we offer a comprehensive range of therapy services to meet your needs and support your overall health and well-being. We don’t merely treat symptoms and separate parts of your body, we look at your entire neuromusculoskeletal system with a whole-body perspective that supports your recovery. 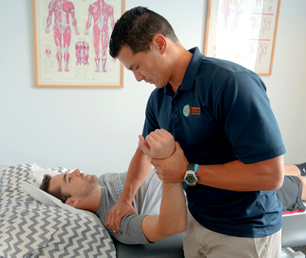 Each patient receives personalized, one-on-one attention from our highly trained, certified and licensed physical therapists—100% of the time. At GGPT, we’ll never put your care in the hands of aides and assistants. We’ve found that maintaining our high standard of individual attention increases our patients’ success rate of reaching their goals. If you don’t see your specific area of concern addressed on our website or have questions, please contact us for a free phone consultation with a physical therapist to see how we can help.